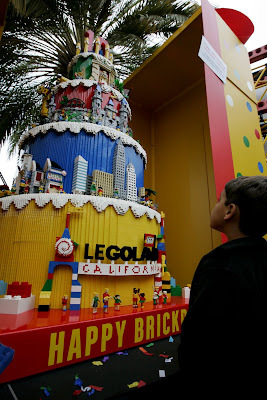 Cake Wrecks: Sunday Sweets: Legos! 'Course, those cakes are made of real Legos. But how about some cakes made of Legos made of cake? Play on, sweets, play on. Legos made of cake are the best kind! I was gonna be all sad that the first two weren't cakes until I saw the real deal - wowza! There's just something sensational about lego design that makes it so cool AND yummy looking. AWESOME! Off to Lego Land in the Uk in a couple of weeks with the kids....cant wait! Those are awesome! 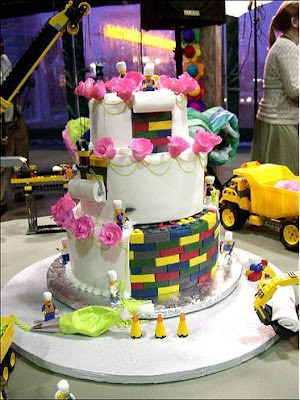 I had no idea legos were so popular for wedding cakes! Makes me want to break out the legos that have been sitting in the basement for ten years. Wowza!!! It's so amazing what people can do with cake! I wish to be as good as them! Oh, these are the coolest! Can't wait to show them to my 10-year-old!!! This is my favorite Sweets, yet! Awesome! 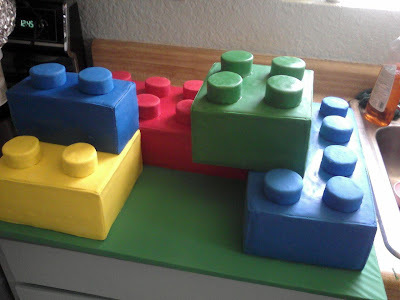 I loved the cakes but was slightly more intrigued by your use of the term 'legos' (plural) - here in the UK, we say 'Lego' (singular) when referring to it, even when looking at multiple bricks. . . . a bit like sheep. If looking at a field of wooly jacketed mammals, do you say sheeps whereas we Brits would say sheep? 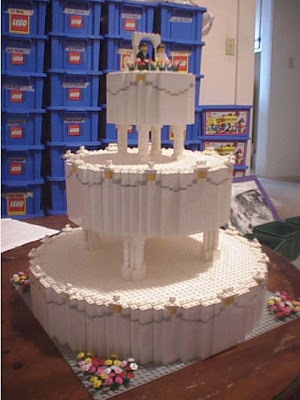 I wonder why someone would want a Lego wedding cake? Unless it was two six-year-olds taking the vows. hmmm. I have a couple of lego kids over here and they went CRAZY for those cakes. Very cool. Yes. Yes. Yes. Excellent S.S. I believe that the monster version is a Duplo cake. Several years ago I used to care for a young man on the Autistic Spectrum who was fixated with Duplo and Lego, and constantly had a piece in his hand or held up to the light. He was totally non-verbal but you knew he liked you if he let you have a piece of his Lego; a great honour. Three heads. Three pairs of legs. Only two torsos. I work for a science camp in Canada and have met some real LEGO fanatics. Apparently the word "LEGOs" is incorrect in any culture, and the correct pluralization is not to add an "s" - like sheep. Oh, those "under construction" ones with the little Lego guys rolling out the fondant over the "bricks" are adorable! Ohhhhh I love those cupcakes!! How precious. Just because I spend my time looking for odd things to buy to make cookies and cake more fun! Long time reader, first time poster - thank you for your inspirational sunday sweet posts. 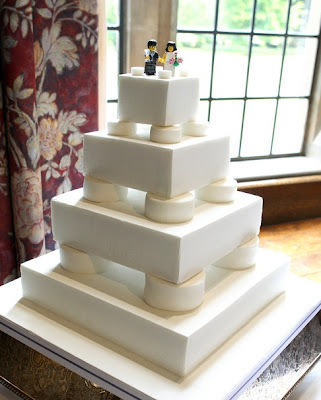 These cakes are amazing - I wish we would have thought of a lego cake before we got married!!!! AMAZING stuff! First time commenter-these are great! I also love the ones with the workers rolling out the fondant. So creative! I graduated this morning from Carnegie Mellon University with a bachelors degree in Mechanical Engineering. Having a LEGO theme for todays Sunday Sweets was absolutely perfect timing. Thank you. My jaw literally dropped on some of these. Absolutely awesome!!! I think Chocmocake's version is of Duplos. My 22 year old son is going to flip when I show him these cakes tonight. Lego(s) were a large part of his growing up. We had 3 70 qt buckets of Legos. The piece they NEEDED was ALWAYS in the bottom of the third one. They didn't have a Lego vac back then. Picking up Legos is a PITA. And you always leave one to find with your bare foot at night. 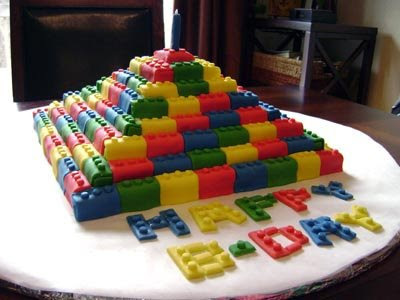 My Lego cake (the pyramid one) is on your blog!!!!! HOLY POO!!!!! WOOOHOOOO!!!! Oh wow, I love the 'in construction' cakes. Although that first one is really busy with all the colors; the other one did it much better with more simple colors. Legos rock! Those cakes are awesome. Just got home from the lego store and ta-da...lego cakes!!! love it! I am in complete awe of all these. Though the one where the lego guys are building the wedding cake! SOOOOO Awesome!! And the picture with all the buckets of legos... Yeah when I was a kid I had all my legos seperated like that, please tell me I wasn't the only one! Playing with legos is a fond childhood memory, though Mom would often scold me for putting legos in my mouth. Now I have to show her this blog and prove to her once and for all that legos certainly do have their place as part of a food group. My two favourite things! LEGO and cake! ... well ok I can't think of anything it's similar too. It's just not done. I am friends with the guy who made the cake in his house (with all the bins in the background). He helped me with my Trig homework in high school. Eric's a really awesome guy. There are a LOT of adult lego users out there all over the world. You should see my basement!!! So these were especially sweet. Thanks. i worked at legoland for 2 year. i worked as an orientation leader and would spend my time training all our new recruits (or as we were called, model citizens, MC for short)i loved my job there and shockingly i knew a ton of the MCs who were called our model builders... yes they got paid the big bucks to play with legos all year round! well... i have to say now that i have moved away to japan because of my hubby and his military career this sunday sweet sure has taken me back and makes me remember all the wonderful smiles i would see out in that park. 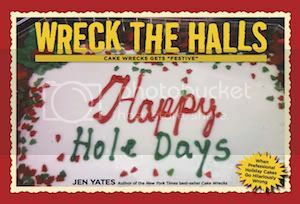 i sure do miss those days... especially all the celebrities i met... in all this has got to be my favorite cake post on cake wrecks so far... man that first picture made me almost cry... it sure is the best place to work! ps for all of you out there if you want to say multiple lego pieces... we always had to say LEGO BRICKS! hope that helps. also if you wanted to know LEGO in german stands for play well... so everyone play well! oh and if you all wanted to know LEGO bricks began as a furniture store... then kirk christenson came up with LEGO bricks, and eventually his factory was burnt to the ground by his son, so he re-built and searched for a way to improve his LEGO bricks. thats when plastic was invented... then soon came the plastic lego bricks.... the rest is history! Love the on that looks like its being built by the lego men... very cool! Jumpin Monkies, truly inspirational, but really, Lego wedding cake.....erm no I really don't get that, I think I lead a too sheltered life. Perhaps. At first I felt sad that my wedding cake was so "normal" but then I realized that these Sunday Sweet cakes probably cost a lot of money so I will enjoy pictures of them and be happy that my cake came included with my reception deal :-) although I wonder what I would have come up with had I had no limits.... hmmm... possibilities are endless... a nascar racetrack made of legos? a lego church? a lego beach scene to go with my "not on a beach" beach themed wedding?? These are wonderful. 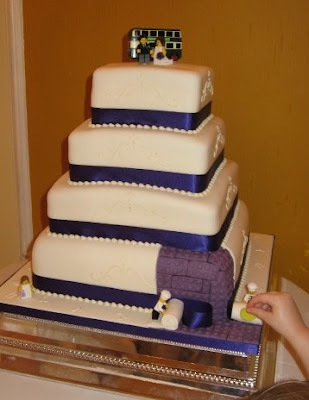 And I am totally in love with that first wedding cake one with the colored legos as the interior structure of the cake. Just fabulous! OH man. that last cake is so adorable. I love that little baker at the bottom with his jaunty cap, rolling out the fondant. Mmm... I want a lego cake. Those last ones are too cool. Very impressive and yummy looking. 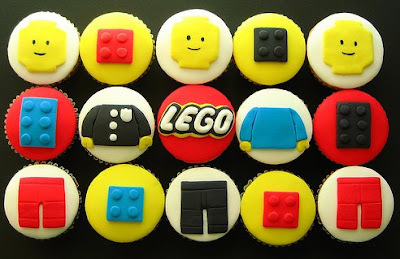 Oh I just love the Lego cakes. I wish I had seen this before my brother got married! I made my husband a Lego cake for his 30th birthday last year! It was fun. And cute. But not as awesome as these! i love the first minimalist lego wedding cake. Seeing all these Sunday Sweets make me really think about what I want my wedding cake to look like. I feel excited. But then I see the Wrecks and imagine myself as the bride in the green dress with the rollers in her hair and the look of profound bewilderment on her face and that cake with the crackly chocolate sludge. Then I feel sad. It's possible that this is mean-spirited, but it's LEGO, not Legos. Calling it Legos is like calling Pepsi Pupsi - it's just wrooooong! Love the site, love the wrecks, but don't want to see you wrecking your own wreckery. Lego Lego Lego Lego Lego, m-kay? IT'S LEGO NOT LEGOS AAAAARRRRRRRGGGGGHHHHH!!!!! L E G O ! ! ! Fantastic.!! I can't wait to make a Lego cake my own.